Think of Austria and it's a tussle for the iconic image that will pop into your head first: Julie Andrews spinning on a mountain top, Vienna's imperial dazzle, the snowy peaks of the Alps... This former heart of the Austro-Hungarian empire sits at the base of the Alps and the crossroads of central Europe - and if the ambience here is more nostalgia than innovation, and more poise than pizzazz, then it's easy to understand why. European high culture was dominated by Austria for centuries during the reign of the Hapsburg dynasty. This is the land of Mozart and Strauss, Freud and Klimt, of grand palaces, onion-bulb churches and beautiful Baroque and Art Nouveau buildings. These days, old and new combine in a seamless experience for visitors, transport links are superb and tourist infrastructure is frighteningly well organised, ensuring you won't miss any of the experiences Austria has to offer. Sunday 12th: We leave this morning heading south to Dover where we take our short sea crossing to Calais we then travel through Belgium to the German border for our overnight dinner bed and breakfast just over the border into Germany. Monday 13th: We continue today through Germany into Austria and onto our main holiday destination in Aschaber and the Lifthotel. Tuesday 14th: Today travel the short distance to the lovely town of Kitzbühel to enjoy a horse drawn carriage ride and free time before heading on to Zee am See a quintessential Austrian resort, a compact town of picture-postcard perfection, with a lake on one side and an impressive mountain hinterland on the other. Wednesday 15th: Today we head over the beautiful Old Brenner pass over the Italian border to the small town of Vipiteno returning via the New Brenner Pass to Innsbruck the capital of the Austrian Tyrol, which has many attractions including the old quarter with its cobbled streets where you can stroll round the charming shops and cafes. 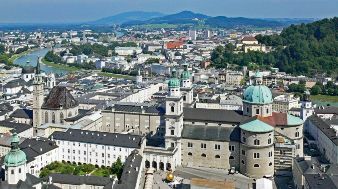 Thursday 16th: Full day excursion takes us to the magical city of Salzburg. We include a guide to help familiarize you with the home of one of the world’s most famous composers – Mozart. With plenty of Museums, stunning houses, bustling squares exquisite Mozart chocolate bars and liqueurs. You certainly won’t get bored. Friday 17th: Today we take a scenic drive to the beautiful Lake Achensee. We then continue on to Rattenberg, on the River Inn, the smallest city in the Tyrol. It is a serious glass-making centre and a walk down the main street, Sudtirolerstraase, brings this to life with shop after shop displaying high quality crystal and glass products and antiques. This afternoon we also enjoy an apple strudel show and visit Kisslinger Glass Blowers in the town. Saturday 18th: Sadly it’s time to leave Kirchberg and start our journey homeward out of Austria back to the German/Belgium borders for our overnight stay. Sunday 19th: We continue our journey home taking the short Calais to Dover sea crossing for our final leg of the journey home. At the Lifthotel in Aschaber you can experience Tyrolean hospitality first hand. Immerse yourself in the comfort of a traditional Austrian hotel; you can be pampered by the spa facilities, which include a sauna and a solarium.